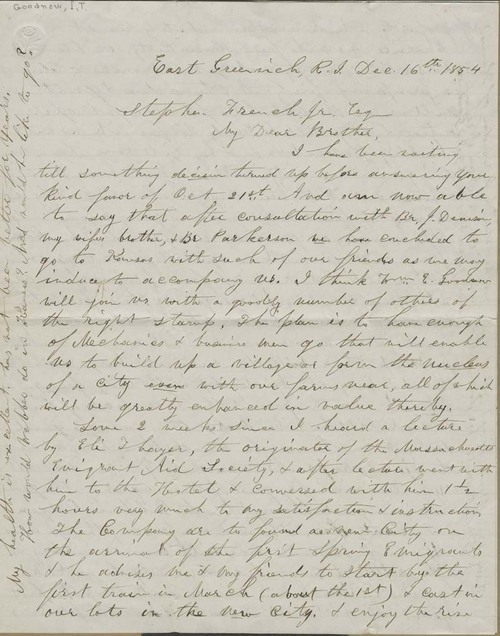 Isaac Goodnow wrote from East Greenwich, Massachusetts, to Stephen French Jr. Goodnow communicated his excitement of having decided to emigrate to Kansas Territory the coming March, inspired by a conversation with Eli Thayer two weeks before. His motivations were varied, as he expressed his desire to see that slavery was prohibited in the Territory. However, he also mentioned that emigration to the Territory was a good way to get rich, and hoped that the climate there would be more suitable for his ailing wife, Ellen. Isaac Tichenor Goodnow to Stephen French, Jr.